« Character building, or what? 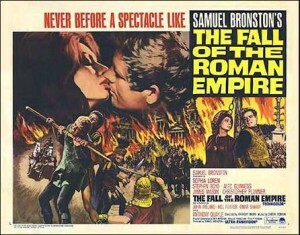 “The Fall of the Roman Empire” was a 1964 epic film starring Sophia Loren, Stephen Boyd, Alec Guinness, James Mason and Christopher Plummer. Emperor Marcus Aurelius was dying and did not want his unpleasant son Commodus to succeed him. The final scene of the film shows Rome in total chaos. But the end of Rome wasn’t quite like that. Marcus Aurelius and Commodus reigned to AD 180 and AD 192 respectively and the Western Roman Empire didn’t end technically for nearly another three hundred years in AD 476 with the abdication of Emperor Romulus Augustulus, a boy of sixteen, and the assassination in AD 480 of Julius Nepos, another contender. The Eastern Roman Empire continued for several more hundred years but declined steadily from the twelfth century until the Fall of Constantinople (Byzantium) in 1453. In AD 376 (pre-the Battle of Adrianople) large numbers of Goths crossed the Danube River. They sought admission to the territory of the Roman Empire, which despite having both new and longstanding systematic weaknesses, still wielded effective power across the area surrounding the Mediterranean and beyond. The Empire had large numbers of trained, supplied and disciplined soldiers, a comprehensive civil administration based in thriving cities with effective control over public finances and it maintained a high wealth economy, complex social structure and legal system. Its wide-ranging trade networks allowed even modest households to possess goods manufactured the other side of the known world. Among its literate and political elite it enjoyed ideological legitimacy as the only worthwhile form of civilization and a comprehensive and sophisticated cultural base including the arts, literature and rhetoric. 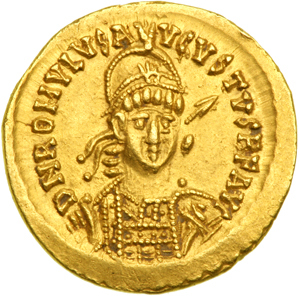 Only a hundred years later, when Odoacer, a Roman general of Germanic, possibly Hunnic origin, deposed the Emperor Romulus, the Western Roman Empire wielded negligible military, political, or financial power and had no effective control over the scattered Western domains that still described themselves as Roman. Some provinces struggled on, e.g. the Domain of Soissons in northern France where in AD 486 Syriagus the then “King of the Romans” came up against the most dynamic and ruthless leader of the new Europe, the Frankish king Clovis, and lost one of the few remaining outlying Roman provinces at the Battle of Soissons. Trade, public services, communications and above all legitimacy had broken down and the remaining Romans were unable to hold on to their diminishing territories. 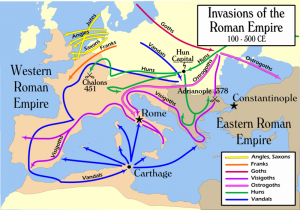 Barbarian invasions, the settlement of non-Romans within the Empire and the growth and migration of vigorous warlike peoples in Europe (Franks, Goths, Alans, Burgundians, Alemans) piled the pressure onto brittle systems ready to snap. The Western Roman Empire localised and eventually dissolved like chain mail fragmenting into separate links, giving way to rump states, local city states and petty kingdoms ruled sometimes by members of the established Romanized ruling elite, sometimes by the invaders. In the southern parts of France, Italy and Spain and the Iberian Mediterranean coast Roman culture lasted until the 6th or 7th centuries. So, what did the Romans do for us at their dusk? Many of their buildings, roads and monuments were used for centuries afterwards, especially in continental Europe. 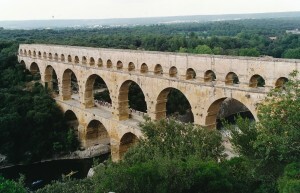 Some parts of the Nimes aqueduct, which includes the famous Pont du Gard, is said to have supplied local farmers into the 10th century. 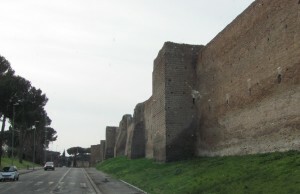 The Aurelian Walls in Rome served as significant military defence for the city until 1870. But population decline of over 20% between AD 400 and AD 600, the loss of technological knowledge, systemised agriculture and manufacturing in Europe from late antiquity into the early middle ages (approximately AD 400-AD 750), the scarcity of artistic and cultural output including historical records, when compared with both earlier and later times, led Petrarch and others to call it the “Dark Ages”. Modern historians prefer to call it the “Early Middle Ages”, but it remains a period of disintegration, impoverishment and rupture, not helped by climate cooling around AD 450-500 and waves of plague and smallpox in the sixth century. A dark period indeed. By the early AD 700s, agricultural, social and political conditions had started to improve and the climb out of retrenchment began. However, the greatest light in the darkness that persisted from the collapse of the Western Roman Empire, and into the centuries to come, was the gift of Latin as a lingua franca. By the end of Empire, Latin had spread to many Mediterranean and some northern European regions. 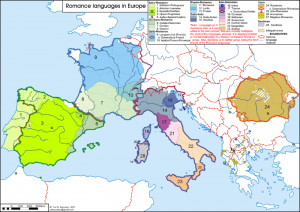 Dialects spoken in these areas, mixed to various degrees with the local languages, developed into modern Romance languages such as Italian, French, Spanish, Portuguese and Romanian. Many Latin words came back to Britain via Old French. Classical Latin itself slowly changed with the disintegration of the Western Empire as education, recording skills and wealth diminished. The consequent Medieval Latin, influenced by Germanic and proto-Romance languages until expurgated by Renaissance scholars, was used as the language of international communication, scholarship, and science until well into the 18th century, when it began to be supplanted by national languages. But apart from naming plants and animals and studying history and archaeology, there is still great interest in Latin as a door into the Roman world. And if a little piece of the Roman Empire had struggled through history into the 21st century but had changed its social structure in order to survive, could it have a heroine like Carina Mitela…? Read about her latest adventure in PERFIDITAS, the sequel to INCEPTIO. 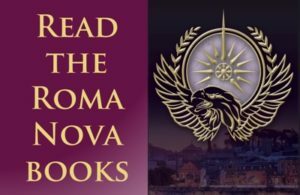 Alison Morton ‎ Shedding light on the Roman dusk (that’s me!) 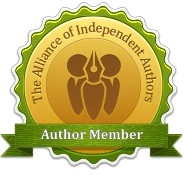 – Plus a Giveaway Prize! 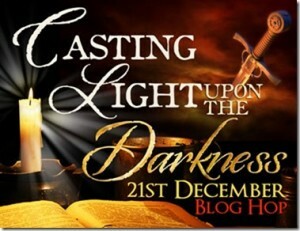 Petrea Burchard : Darkness – how did people of the past cope with the dark? Plus a Giveaway Prize! I reckon it’s up there with Ben Hur. It was a sticky period, granted, but after Commodus, and a few “inbetweens”, you hade the Severans, 50% bad, 50% quite reasonable and after the third century crisis the Constantinians. So plenty of fuel left in the tank for a while. The Roman Empire… I have barely scratched the surface on its history. Thanks for the help. Glad to have helped, Debbie! Very interesting post, Alison, and the Romans certainly left a lasting impression! More than most people realise. For instance, there’s an ATM in the Vatican City that uses Latin…. Gosh, what a thorough and thoroughly interesting overview, Alison. And 257 reasons for the Fall – that would frighten the life out of modern rulers everywhere, I’m sure, even if that chap was only joking. Glad to see my favourite aqueduct featured here too, btw! didn’t help, the turn towards a comfortable life rather than a military career, the rise of Christianity and the ‘barbarianisation’ of the army are some of them. Only 253 more to go! Alison, this is fascinating! My study has been focused on post-Roman Britain, so your post really gives me some great context. I appreciate all the detail. 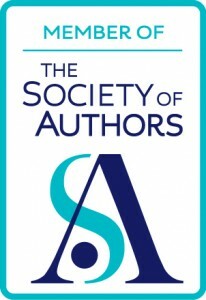 Best of luck with your writing! Thanks, Nicole. Although I love the early imperial period, I’m fascinated by the later centuries, especially the turning point of AD 395 when Theodosius finally banned all traditional Roman religion and demolished much of the early symbols of ‘Romanitas’ (Roman-ness), such as the Vestals’ flame and the Altar of Victory. This is, of course, the impetus behind Roman pagan dissidents setting off to found their own province/nation – Roma Nova. Nothing lasts for ever, right? I find the fading years of the Roman Empire of particular interest as they also coincide with the mass migrations of the Germanic tribes through Europe. Great post! Thank you, Anna. The Great Migrations were indeed very important and their dynamism gave rise to the new nations of post-Roman Europe. Always fascinating to study transitions! I loved Inceptio – am saving #2 for a Christmas treat! Thank you, Helen, glad you enjoyed INCEPTIO and I hope the same for PERFIDITAS! The fall of this empire has not truly happened. My reasearch of this great time continues to echo through time. I LOVE IT. I wonder what it would have been like has Rome not fallen. We’da had A/C sooner maybe. Rome continues to fascinate many of us right up to today. It’s a constant inspiration for me. What a wild time in which to live! And I do mean wild. Indeed! Despite all the little things that irritate us today and the major ones that make us cross and sad, I think we live in very comfortable times even though most of us don’t speak Latin.